Orders can only be cancelled in Brightpearl if no items have been marked as shipped, the order is unpaid and not invoiced. The order will also need to be cancelled in eBay. The first thing you should do is double check the order has not been paid. If it has been paid check out the scenarios below. If none of the items on an order have been shipped in Brightpearl, it can be cancelled. Even if you have completed some of the steps towards shipping in Brightpearl (fulfill, print, pick, pack) it can be completely reversed and cancelled as long as it hasn’t been shipped. The order will also need to be cancelled in eBay. An order is cancelled in Brightpearl by moving it to your “cancelled” sales status. Choose your cancelled status as Settings > Sales > Sales workflow . In eBay, cancel and refund the order. In Brightpearl, process a negative payment against the original sales order. Now the order is unpaid you can move it to the "cancelled" status. Although Brightpearl offers an un-invoicing feature (which would allow the order to then be cancelled) you may prefer to clone the items on the order to a sales credit. If using a sales credit, mark it as credited. There is no need to process the refund or receive inventory if no money of stock changed hands. In eBay, cancel the order. Since the order shipping status will remain unshipped these orders will continue to show in "due to ship" order lists. In order to prevent this the order would need to be fully completed through shipping and payment. These steps will remove inventory and create accounting, so will need to be reversed on the sales credit by receiving the inventory and processing a refund. Read more about this in scenario 4. In Brightpearl, clone the items on the order to a sales credit, create the credit note and process the refund. In eBay, cancel the order and refund the money. You can edit the order in Brightpearl directly, and we will still handle shipping updates to eBay based on the order reference number. However, eBay would continue to show the first item ordered as you cannot update eBay orders in the same way. If you would prefer eBay to be updated to show the correct item ordered, then best practice is to cancel the order in eBay, refund your customer and sell the correct item to the buyer. You will also need to raise a Sales Credit in Brightpearl for the refunded item. Search for and open the original sales order containing the items to be credited or returned. Alternatively, a credit can be started from Sales > New Credit . Select the lines that are being credited, or returned. Note that quantities can be edited directly on the credit later. 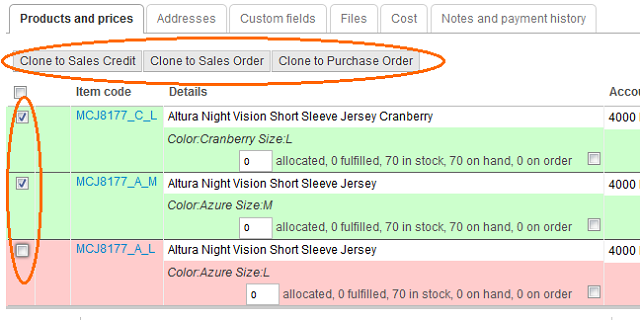 Click the Clone to Sales Credit button just above the line items. Search for the journal. If you know the journal ID go to Accounting > Corrections. Enter a reason for the modification. This is useful if you need to investigate the changes in the future. Make the necessary amendments to the references, nominal codes, values and tax codes. For example, to dettach a payment from an invoice, remove the invoice references. A change history is displayed within the journal record so if required you can reverse the changes by re-entering the details. Note : A VAT reconciled or Bank reconciled journal cannot be edited unless you unreconcile it first.